Welcome! The lobby of the Deranged L.A. Crimes theater is open! Grab a bucket of popcorn, some Milk Duds and a Coke and find a seat. 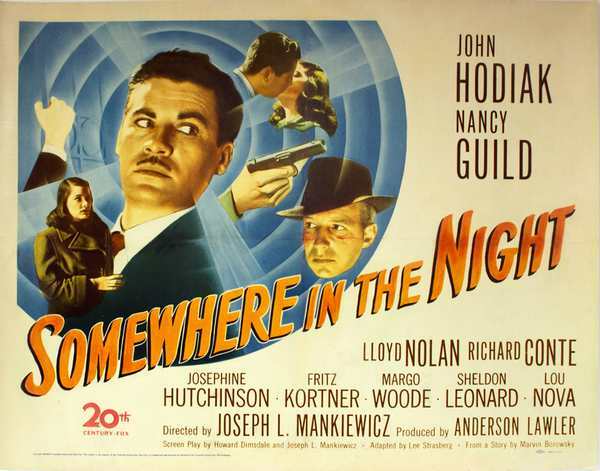 Tonight’s feature is SOMEWHERE IN THE NIGHT, 1946, starring Lloyd Nolan and Richard Conte. A U.S. Marine recovering from a combat injury in a Navy hospital in Hawaii suffers from undiagnosed amnesia, and while others call him George Taylor, he has no memory of that man. Upon recovery from his wounds, George is transferred to the hospital at Camp Pendleton, California, and is eventually discharged, even though he still has no memory. He returns to his old civilian address at the Martin Hotel in Los Angeles, but no one recognizes him there. At Union Station, he exchanges a bag check he found in his sea bag for a briefcase, which contains a gun and a three-year-old letter to a man named George stating that $5,000 has been deposited for him in a bank account by Larry Cravat. Amnesia, guns, and money. Sounds interesting to me! Enjoy the movie! 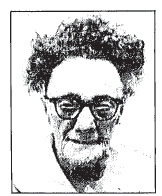 At about 5 p.m. on Friday, January 19, 1935, Vera Woodman was in her Boyle Heights apartment when she heard a sound. 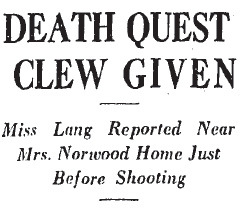 She wasn’t sure what had caused the noise, but it sounded like a gunshot and it had come from next door–226 North Bailey Street–the home of Edith Eufala Norwood, widow and treasurer of White Memorial Church. Vera walked over to Eufala’s house and tried the door but then she hear a key turn in the lock. There was no further sound so Vera thought that perhaps her neighbor was not in the mood for company and she returned to her apartment. The next day William Norwood, who worked as the registrar as the White Memorial Hospital down the street from his mother’s house, dropped by to see her. When he entered the house he noticed it was extremely quiet. He called out but there was no answer. He went into the kitchen and that where he found his mother. She was dead, but there was nothing to suggest foul play until she was examined at the morgue. Eufala had been wearing a bulky sweater at the time of her death and it had concealed a fatal bullet wound to her brain. The police had the how, now they needed to discover who and why. Good police work means shaking the trees until something happens. A tried and true method is to knock on doors and question friends, family, and neighbors of the deceased. In this case the neighbors had seen more than they had realized. Dora Byler, a nurse at White Memorial Hospital, found a handbag belonging to Isa Lang, a former boarder in Eufala’s home. It was on the sidewalk about a half-block from the murder scene. Other neighbors said they had seen Isa, shortly before 5 p.m. on Friday, she was carrying a bundle and hurrying away from the Norwood home. When detectives caught up with Isa she admitted that she had stopped by Edith’s home on Friday, but she said it wasn’t as late in the afternoon as witnesses had stated. She’d arrived at 3 p.m. and found the door open but her former landlady was not at home. Isa said that she packed the remainder of her belongings and left without ever having seen or spoken to Eufala. 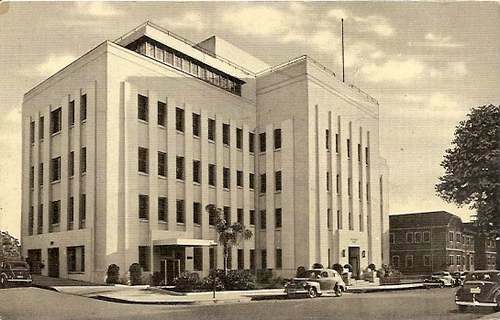 A Coroner’s inquest was held at 1:30 p.m. on January 23 and all of the neighborhood witnesses, subpoenaed by Captain B.W. Thomason, testified. The prime suspect in the slaying, former school teacher Isa Lang, took the stand too. She emphatically denied being at Edith’s home at the time of the murder, she said she had been there at least two hours prior to when the gunshot had been heard. No one came forward to corroborate her story and Isa’s denials fell on deaf ears. The jury found that she had shot Edith with homicidal intent. A week following the inquest Isa confessed to Deputy District Attorney Arterberry that she was guilty. She told him that after the murder she returned to her new boarding house at 120 South Boyle Avenue. The next day she went to Manhattan Beach and threw the revolver into the ocean. The gun had belonged to the dead woman and was kept in a living room closet. The confession was important, but everyone wanted an explanation. What was the motive? Evidently the two women had had several petty quarrels, and during one of them Eufala ordered Isa to leave the house permanently. Isa found a new place on South Boyle Avenue and on January 18, the day of the murder, she had returned to retrieve the rest of her personal belongings. Moving is hungry work and Isa said that by the time she got to her old digs she needed sustenance. She pulled open the icebox door and found an delicious looking avocado sandwich. She was just about to take a bite when Eufala came in and took umbrage with Isa’s appropriation of her lunch. Eufala made a grab for the disputed treat and Isa became “insanely angry”. 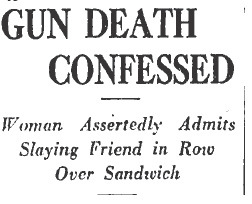 Only a madwoman would commit murder over a sandwich, at least that is what Isa’s defense contended. What would a judge and jury make of an insanity plea? NEXT TIME: A Cell of One’s Own concludes. Many thanks to my friend and fellow historian Mike Fratantoni. He finds the most deranged cases. Welcome! The lobby of the Deranged L.A. Crimes theater is open! Grab a bucket of popcorn, some Milk Duds and a Coke and find a seat. 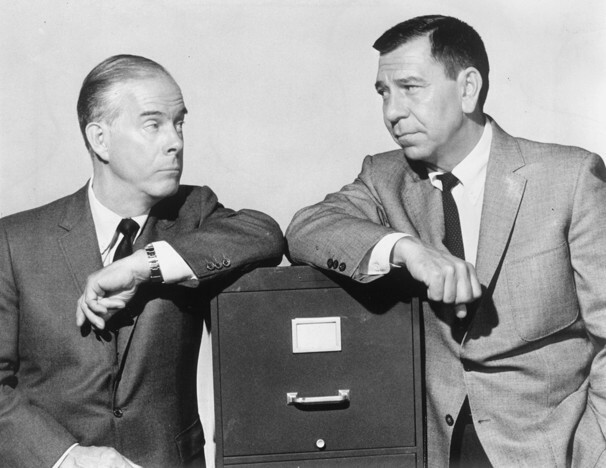 Tonight’s feature is DRAGNET 1966, starring Jack Webb and Harry Morgan. I’ve show this feature before but I thought that since I’m attending the JACK WEBB AWARDS event tonight it would be appropriate to show it again. I’m looking forward to the evening. It will, once again, be hosted by James Ellroy. Dragnet 1966 is a made-for-TV movie that initiated the return of the Dragnet series to television. It was intended to be the TV pilot of Dragnet 1967 but was not aired as originally planned. It was eventually broadcast in 1969. Sgt. Joe Friday is called back from vacation to work with his partner, Off. Bill Gannon, on a missing persons case. Two amateur female models and a young war widow have vanished, having been last seen with one J. Johnson. In the course of tracking down Johnson and the young ladies, the detectives wind up with two different descriptions of the suspect, one of which closely resembles a dead body found in a vacant lot. But the dead man, later identified as Charles LeBorg of France, proves not to be J. Johnson, when a third young model disappears. The story is based on the Harvey Glatman case which I covered in a series of posts. 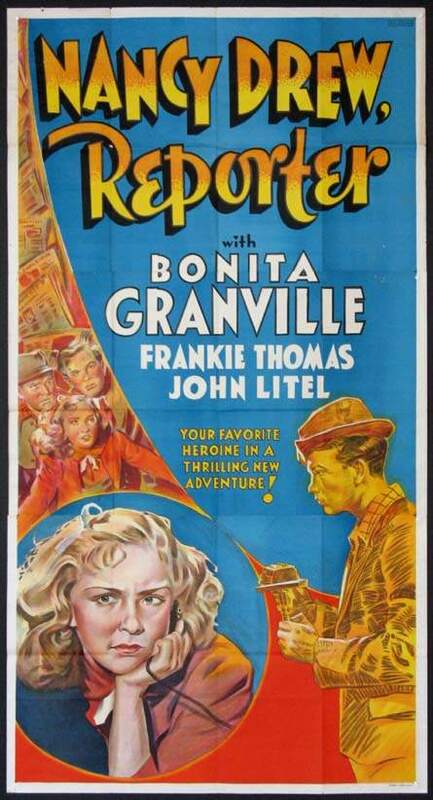 Tonight’s feature, NANCY DREW–REPORTER, may not be film noir, but I’ve got female reporters on the brain today. I was interviewed this afternoon by KCRW (89.9 FM) in Los Angeles about the photo exhibit I’m curating at Central Library. The exhibit: THE FIRST WITH THE LATEST! : AGGIE UNDERWOOD, THE HERALD, AND THE SORDID CRIMES OF A CITY runs until January 10, 2016. Here is a LINK to the radio interview. When the newspaper runs a promotional contest awarding fifty dollars for the best story written by a high school journalist, Bostwick, the city editor, decides to wash his hands of the kids by assigning them to cover trivial topics. 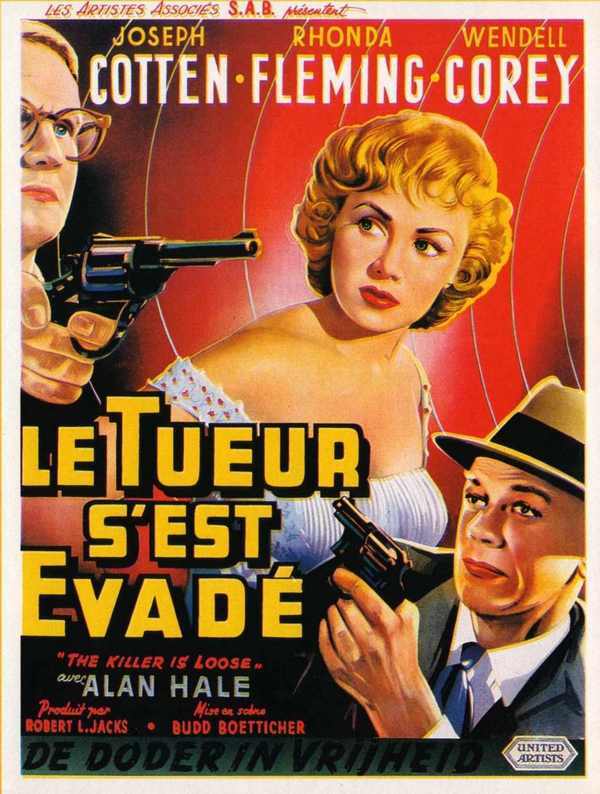 Undaunted, student reporter Nancy Drew, the daughter of District Attorney Carson Drew, overhears the staff discussing the Lambert murder hearing and decides to cover the trial herself. 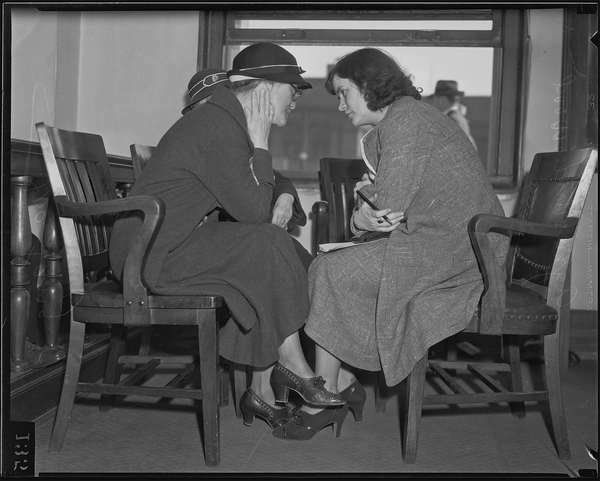 At the courthouse, Nancy sits next to a man with a cauliflower ear and listens intently as Eula Denning, the murder victim’s ward, is accused of poisoning Kate Lambert for the inheritance money. Enjoy the movie and the radio interview! John Joseph Stanley has worked in law enforcement and corrections as a peace officer for over thirty years. He he is the author of over sixty articles on law enforcement history and tactics and has won awards for his fiction and historical nonfiction. In addition to continuing to write fiction, John currently writes a column for the website CorrectionsOne.com, contributes to the website PoliceOne.com and writes a tactical history column for the California Association of Tactical Officers (CATO) quarterly publication CATO News. He is also the principle contributor to multiple law enforcement related Facebook pages including: The Los Angeles County Sheriffs’ Museum, The Los Angeles County Peace Officers’ Memorial, and Tactical Science. The depth and breadth of his accomplishments continue to astound me–in particular his fascinating novel CAGED SPIRITS. It seems like it was ages ago that he revealed that he to me that he was working on a novel. When I asked him what it was about he offered me only a few tantalizing bits to ponder: Nazis, the supernatural, and law enforcement. As I discovered after reading it, It is also about love, loss, and redemption. Recently, John was gracious enough to grant me an interview. Joan Renner: John, I want to congratulate you on your first novel, CAGED SPIRITS! I thoroughly enjoyed it. It’s a unique book which defies categorization. It combines the best elements of mystery, thriller, and horror fiction. What inspired you to write the book? John Joseph Stanley: Thank you, Joan. First, I want to thank you for interviewing me and sharing my book with your followers. Caged Spirits reflects my interests and professional experience. As a reader, I’m a big fan of Stephen King, Dean Koontz, J.K. Rowling, Tolkien, and C.S. Lewis, among others. But I also love the works of Tom Clancy, Vince Flynn and Brad Thor. Also, for the better part of thirty years I’ve worked in law enforcement. A lot those years were spent either working in jails or teaching those who worked in jails. Caged Spirits is the outflow of all those tributaries merging into a larger river flowing downstream from my Christian world view. JR: Although set in the present day, the narrative of CAGED SPIRITS is driven by events from the past, in particular WWII. Is the book historically accurate? JJS: Yes, I have a Master’s Degree in American legal history and have published articles in many articles historical books and journals. One of the lesser known parts of the Lend Lease agreement between the U.S. and Great Britain in 1941 called for the U.S. to train RAF pilots. Lone Eagle field is the doppelgänger for the very real Polaris Flight Academy at War Eagle field located in Lancaster, California. There were also prisoner of war camps for Axis soldiers all over the U.S. and Canada. Many were attached to existing military bases and the Los Angeles Sheriff’s Department’s aero squadron before the war did consist mostly of former military pilots. JR: I read a lot of crime fiction and I know that most authors have to consult experts when it comes to the finer points of handling lethal and non-lethal weapons. How were you able to bring such remarkable authenticity to the scenes in which weapons were used? JJS: In my case, I was my own expert. I’m currently a lieutenant on the Los Angeles Sheriff’s Department and command a platoon for one of our four Department riot control teams. I’ve taught less lethal weapons and jail riot and disturbance tactics for almost twenty years. 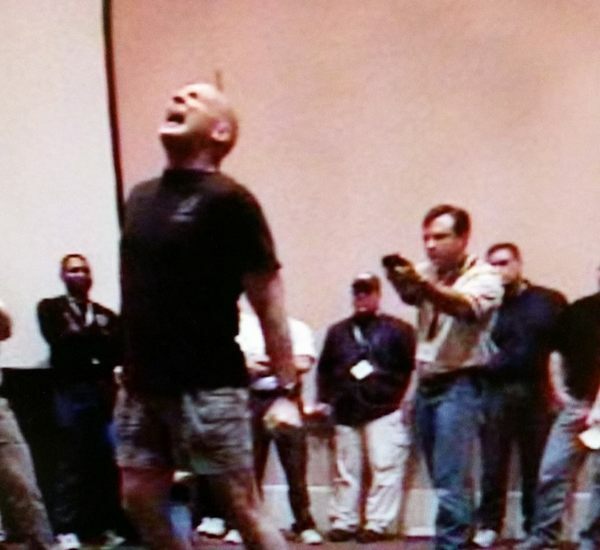 I was also briefly a Senior Master Instructor for TASER International. So I know how all of TASER’s electronic control devices (ECDs) function. Having taken multiple Taser hits over the years, I also know well how the effects of a Taser feel. John’s knowledge of lethal and non-lethal weapons comes from his real life experiences. Here he is taking a Taser hit! JR: Were the tactics employed to contain violent situations in the jail accurate? I found those scenes heart-stopping! JJS: Yes. I’m very familiar with responding to all types of jail disturbances. In addition to my current collateral duties as a platoon commander for our riot control team, I spent almost ten years of my career teaching the LASD’s Custody Incident Command School. This week long class was designed to teach newly promoted sergeants and lieutenants how to command tactical units in any type of jail disturbance. We even did a shorter version of the class for command officers. I’ve also written a column on jail tactics for several years for the website CorrectionsOne.com and recently I started writing a quarterly tactical history column for the CATO News, the magazine of the California Association of Tactical Officers of which I’m a member. JR: Your protagonist, Gary Conner, personifies the traits associated with the term “compassionate warrior”. Would you mind explaining to readers what that term means? JJS: It is the job of law enforcement personnel to be firm but fair. This is especially true when working in a correctional setting. It is not our job to punish. Being incarcerated is punishment enough. Still, inmates expect us to maintain control. Most prefer this. Gary Conner reflects this view. Unfortunately, he finds himself in the middle of extraordinary circumstances when he arrives at Lomax. So his compassion is tempered with his need for decisive forceful action. JR: Is there anything that you would like to share with readers about the story or its setting. JJS: At its heart, Caged Spirits is a story about redemption and forgiveness. I set it in a part of the country that is equal parts enchantment and isolation. Those elements are in the story as well. I challenged myself to write a novel that I could throw down with satisfaction next to books of some of the authors I read. I’m very pleased with how Caged Spirits turned out. JR: Are you planning to write another novel? JJS: Actually, my next novel is already written. It’s titled Racing Apollo. I’m in the process of rewriting it now. My main character is another Los Angeles Sheriff’s deputy, but this one experienced a significant episode in his youth that turned his adult life into a mess. In the story, he is given a very unique opportunity to correct this. Like Caged Spirits, Racing Apollo also involves malevolent dark forces at work to tear down my protagonist, but his biggest enemy is the one looking back at him in the mirror. This was a very fun novel to write. It is a road novel that involves time travel. It is actually two parallel stories that intersect over forty-five years apart. In one story my protagonist, at age ten, is reluctantly moving with his family from Buffalo, New York to Anaheim, California. In the other, his adult self is retracing the journey his family took across the country decades before. The original trip took place in July 1969. Specifically, between the 16th and 20th of July. The novel derives its title because my main character’s father tries to make a game of their move by saying they are racing Apollo 11 as it journeys toward the moon while they head west for California. Like most road novels, this one takes a while to tell and is quite a bit longer than Caged Spirits. Many thanks to John for the interview, and I’m already looking forward to his next novel. 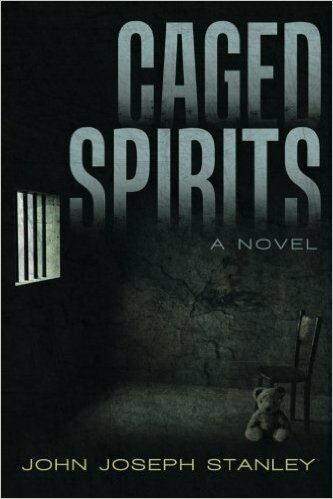 CAGED SPIRITS is available Amazon (see right sidebar) and also through Barnes and Noble.